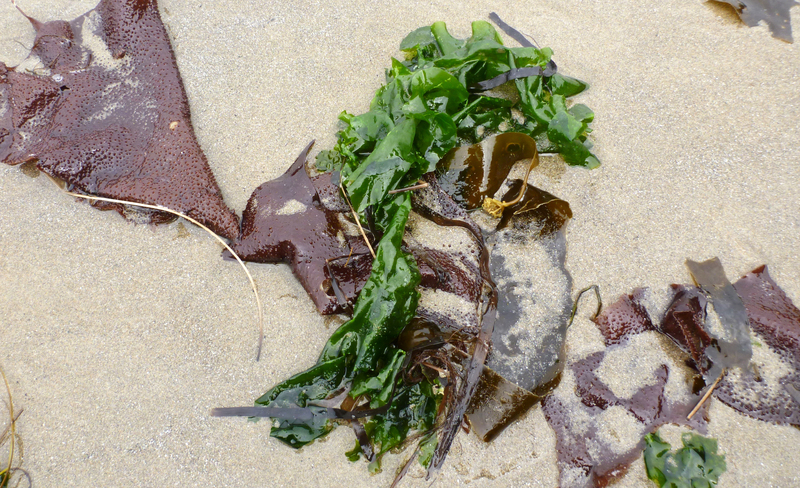 Ulva is frequently observed in the fresh wrack on sandy beaches. 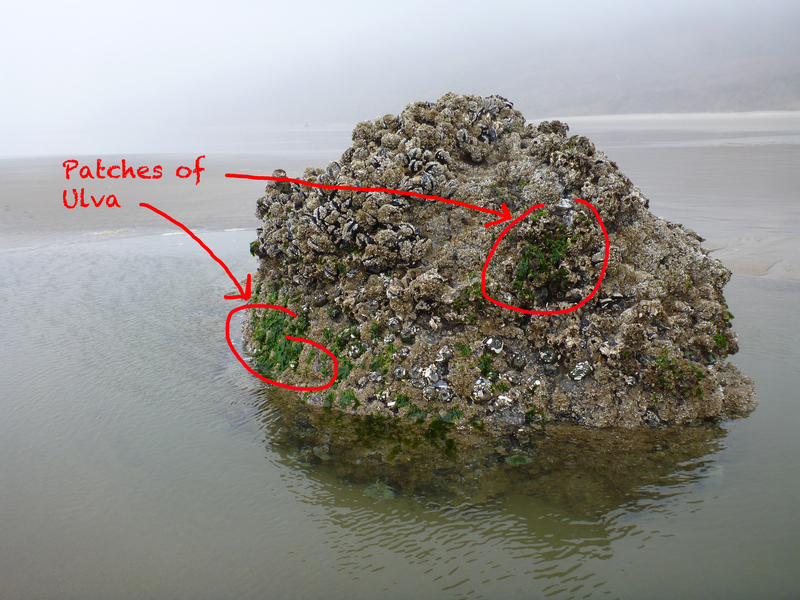 Surf zone sands provide no place for attachment, so Ulva, like other marine plants and and seaweeds, makes it home in the rocky intertidal or in more sheltered settings such as bays and estuaries. When you see it on the beaches, you are looking at broken clumps or fragments that have happened to wash ashore. Once in the wrackline Ulva becomes food and shelter for beach hoppers and other detritus-lovers. In sheltered rocky intertidal setting Ulva forms a lush carpet, often sharing real estate with Fucus (olive patches in the photo below). 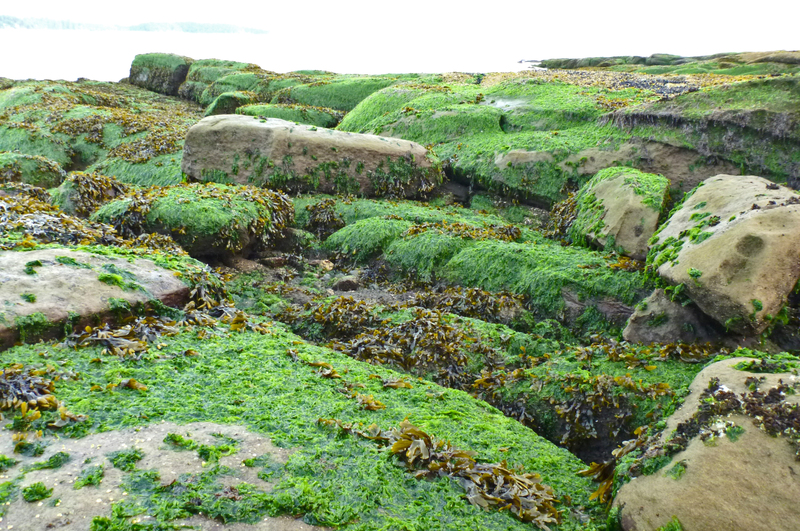 On the exposed outer coast Ulva isn’t able to maintain such a lush carpet-like growth. On surf-swept rocks with sand scouring, Ulva is restricted to sparse patches on protected exposures. There are several species of Ulva but it’s easy to see why the broad-bladed form featured below is called sea lettuce. If you want to learn more about Ulva, checkout the accounts in Seaweeds and Seagrasses Between the Capes, Seaweeds of the Pacific Northwest and Seaweeds of Alaska.